This is How We Ride in L.A. 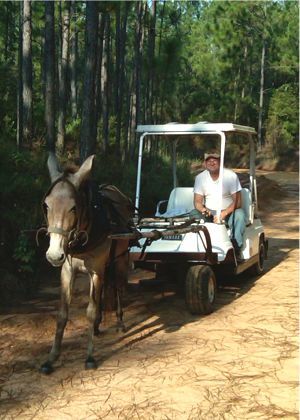 I live out in the middle of the woods in lower Alabama, affectionately known locally as L.A., and I rarely see any traffic on the back roads so I was amazed to come across this gentleman riding along in a golf cart being pulled by a mule. When I passed him again on my way home from dropping the kids at school I HAD to stop and ask if I could take his picture to share with you guys 🙂 He moved his chew to the other cheek and struck a pose for me!